The last few weeks have seen a lot of changes. We left the Faroes on January 19th, sailing once again with Norrøna to Denmark. There are some frustrations attached to travelling by ferry from the Faroes. Check-in opened about 2.30 am and we arrived soon after in freezing temperatures and snow only to sit in the car, engine running and heater on full for two hours while trailer after trailer of fish were driven on board. Finally our turn came only to find that there seemed to have been no reason at all for the wait. The trailer had been going on the lower vehicle deck, the cars went on the upper. it looked suspiciously like we could have been allowed on board and have been tucked up in bed for ages while the trailers came on board. Didn’t put me in the best of moods! Still, the rest of the trip was fine. The weather was better than on the way up so we expected to arrive in Hirtshals on time. But… An hour or so before our scheduled arrival we were informed that the wind was too strong in the harbour to allow us to dock. So for six hours or more, we sailed in a very pretty figure of eight outside of Hirsthals waiting for the wind to subside. We eventually disembarked just after midnight and drove the four hours or so to Dorit’s parents’ summer house outside of Esbjerg. We had a couple of good days there while we waited for the connecting ferry to Harwich. 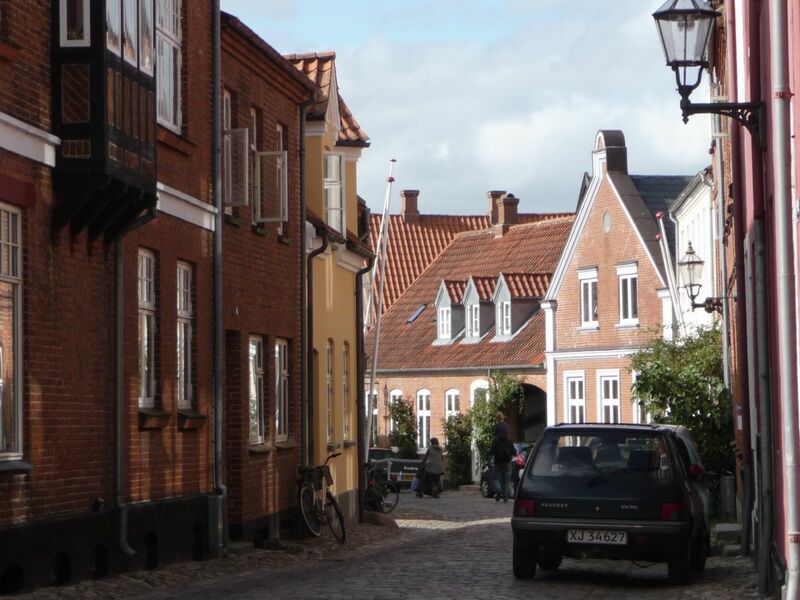 We took a trip to Ribe, just south of Esbjerg, which is a lovely town with a great old centre. Just outside is a Viking museum which we had visited a couple of years ago with friends from England – well worth a visit. The trip to Harwich and then north to Motherwell went smoothly and we arrived at Tilsley College on January 25th. Originally, our plan had been to move into our new home at the beginning of February. However, various issues have arisen which have caused the situation to change. We are still waiting for these issues to be sorted and so are staying in a missionary house in Hamilton, owned by the Christians at Selkirk Street Evangelical Church. We are extremely grateful to them for their hospitality. The house is lovely and only ten minutes or so by car from Tilsley College. But please do pray for our house situation, that the difficulties will be overcome. We are now late in moving in and taking possession so are liable for penalties – though these have been waived so far. Another complication is that our furniture is arriving in the middle of next week. We have already cancelled the removals once and cannot really do that again, so would appreciate prayers for all these things. But mainly that the final bits and pieces will fall into place and we will be able to move. So we have started working at the GLO Centre. Dorit has plenty to do with some of the finance as well as helping out in the GLO bookshop. Good place to go to buy Christian books – and non-Christian as well. Simon is settling into his role at the college, looking forward to teaching in the next few weeks. The next big thing in the calendar is a Mission Orientation week which starts on February 18th, when a number of prospective Echoes missionaries will join our students for a week of teaching in preparation for service. We are both really looking forward to this. Hi – good to know you have arrived even if things haven’t quite worked out fully yet. Praying for a speedy resolution to the ‘home’ issues and for all your work involves. Will check your blog to see what happened in the Mission Orientation Week. Keep us updated on the house issues. Will keep those in my prayers. We miss you and send you our love from Prague.